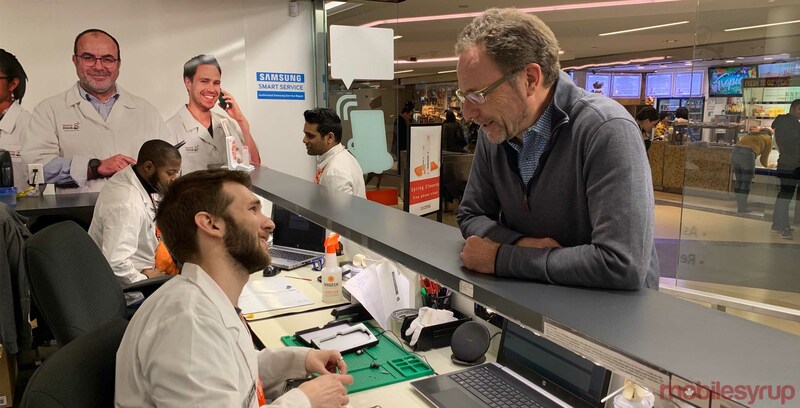 The CEO of a third-party phone repair company welcomes the ‘Right to Repair’ legislation but said if it didn’t pass “nothing would change in the evolution” of smartphone manufacturers outsourcing repairs. Sitting in the food court at Commerce Court in downtown Toronto, Mobile Klinik’s CEO Tim McGuire said that Liberal Ontario Member of Provincial Parliament Michael Coteau’s legislation probably brought on more attention to what the industry has been facing for the past three years. “It’s happening, all of it hasn’t happened yet and…if the legislation went away tomorrow, nothing would change in the evolution that’s going on. The industry gets it and it’s going to change,” McGuire said. Mobile Klinik established itself as a phone and tech repair shop in 2015. Since then it has opened 44 locations in eight provinces. It expects that it will have 80 stores across Canada opened by the end of the year. Coteau introduced his private member’s bill in mid-February that would give consumers protect and give the right to repair their phone with the necessary tools. It would also eliminate electronic waste, and give access to original parts and tools to third-party retailers that repair phones. McGuire explained that it wasn’t until more recently that legitimate repair stores have opened up, allowing for more original equipment manufacturer (OEM) to sell original parts, tools and techniques to fix phones. He said that the Right to Repair legislation would “enhance” the company’s partnership with existing OEMs and with those that have not opened its doors to third-party repair shops. “Not all of the OEMs have been open to the idea of third-party partners,” he said adding that the original strategy was that OEMs would do their own repairs, which would allow them to control the quality and experience customers had. “Over time, the customers are saying ‘this just doesn’t work for me,’ they say that OEMs don’t have a store within 25 miles of where they live, and remember most customers don’t buy phones from manufacturers, they buy it from their carriers. McGuire said Mobile Klinik operates on two types of repairs, those that are under warranty, in which case the manufacturer will pay for all repairs, and those that are out of warranty, where Mobile Klinik will buy original parts and use to repair phones. He said prices vary depending on the type of repair but that 90 percent of repairs can be done, and that each store has $40,000 CAD worth of parts ready to be used. He added that Mobile Klinik has partnerships with most manufacturers and are working on those that are still not open. Apple is one such company that vehemently opposes the Right to Repair. The company’s perspective is that it wants complete control from the moment its products are purchased to the end of its life. McGuire believes those that haven’t opened their doors yet will eventually do so. “Half of the OEMs do it already, Samsung sells to third-party repair providers like ours; they sell original equipment, parts, tools and training. Samsung hardly does any of its own repairs in Canada, they rely on trusted partners like us to provide those repairs and they work with us to make sure we can deliver those repairs at their standards,” he said. McGuire said it was normal for Apple to stick to its own repair facilities and not use third-party vendors and it was because there wasn’t a legitimate industry. “[Apple] had to find a solution and it was easier to do it themselves rather than to create an industry that didn’t exist. The third party exists, it’s professional, high-quality and we are seeing a clear evolution from all the OEMs,” he said.